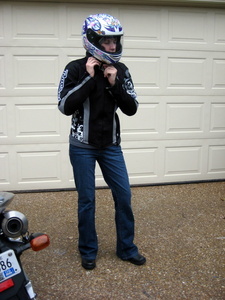 I bought this jacket for my wife after trying it on at the local Honda dealer. I would love to support local business, but I can't pass up saving 25% online with New Enough. Even though she's a light weight, we ended up buying a large because she's 5'9" and needed the arm length. There was plenty of adjustment to tighten up the waist and the fit was pretty good in the end. Thanks again New Enough!